You probably fall into one of three categories. 1. You are a meal planning junky and love it like WHOA. This is me. I love it. I get excited about doing it. And yes, I am seeking counseling with this problem – okay, so I’m not. But it sounded good. 2. You tolerate meal planning. It’s a necessary evil. You get it done because you know it’s a good thing to do, but you’d rather be picking out toe lint. 3. You hate meal planning. It makes you want a lobotomy. No matter which one you fall under, hopefully you’ll find a helpful tip here to make the process more fun and less like having gout and a toothache at the same time. This one is pretty easy. Who ever said you had to plan a whole year, month, or week in advance? The mafia? No. Decide what you want for dinner tomorrow. Get the meat out to thaw or make a quick list of things to pick up that you need to make it happen. For this one, it’s a good idea to keep a notebook or binder full of favorite recipes so you have something to glance at when deciding what the next day holds. This also helps you know what activities might be happening so you can plan appropriately (like if you need a quick meal or have more time to be elaborate). Yeah, I know. That sounds like some kind of dream doesn’t it?! Meal planning all done in 5 minutes?! YES!!! My friend, Amiyrah, from 4 Hats and Frugal shows how to make it happen in 5 minutes. It’s not really my jam…because I like my jam to last longer than 5 minutes. I also like my jam on a piece of toast with butter. Plan the whole month in 10 Minutes! Maybe you do Once a Month Grocery Shopping. If that’s the case, you might want a whole month of meals planned at the same time. If you do that, Amiyrah has you covered as well. She can quickly show you how to plan the entire month in only 10 minutes. Mind. Blown. Use someone else’s meal plan! This one is a little bit harder to navigate, but tons of people have their meal plans up online! Just copy theirs. I’ve heard imitation is the sincerest form of flattery. For these you usually won’t find grocery lists or customized plans based on your dietary needs or weirdo flavor preferences (like sardines on pizza), but it’s a nice stand in for those who just don’t want to meal plan. Pinterest is chock full of these. Just hop on over there and check some out. If you have specific dietary needs, like having grocery lists, or want someone to complain to when your chicken comes out dry as the Sahara, then you might want to just BUY a meal plan. Just kidding about the complaining part…no one likes a complainer. This idea is genius, I think…but of course, everyone thinks they are a genius. Just bite the bullet and make an entire month of meal plans. Then just repeat that same plan every month. Shocking! I would get bored, but hey…we’ve already discussed my issues. Using Plan to Eat (it’s free for 30 days and then VERY affordable) lets you make a whole month of meals, create a grocery list for yourself and then repeat it if needed. 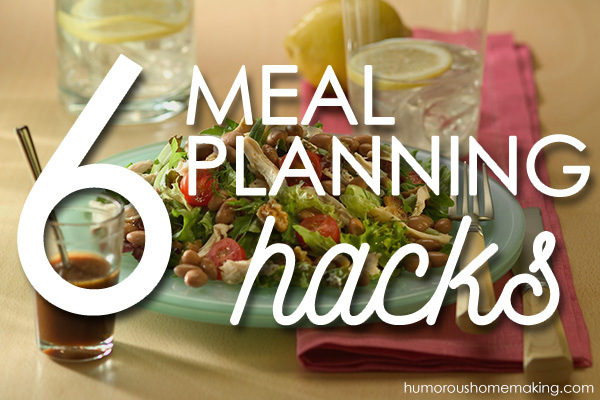 By using the software they provide, you can move meals around as needed based on your crazy schedule. Yes, I am an affiliate with Plan to Eat. No, this entire post was not a tricky ploy to get you to sign up. Just wanted to get that out of the way. *Cough* I’m too tired to ever be tricky. And there you have it! 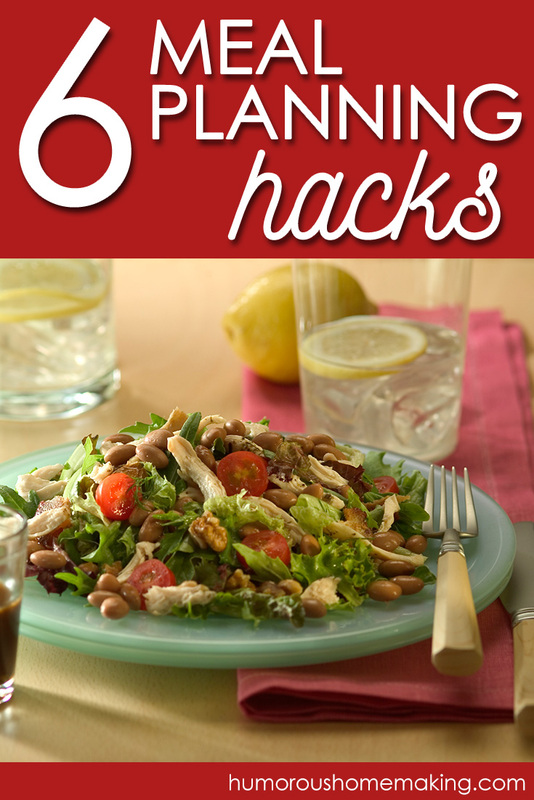 Six ways to make your meal planning life easier. If you would prefer to see our Periscope video where you can get some more great ideas from the comments of viewers, check out the video below! I’ve found it helpful to plan ahead for half a year or so. Including holidays and seasonal stuff. That way I know the family favorites don’t get forgotten in the every day rush. We make a grocery list once or twice a week. Every freezable meal is cooked double and frozen. Some planned meals we skip and switch with something frozen, or dinner elsewhere. We try to keep at least a week’s worth of frozen meals in rotation, in case of flu. Thanks for pinning, Jamie! 🙂 That was super nice of you. I love these ideas! Still being fairly new to meal planning, I started doing the one-day-at-a-time meal planning and am now into a week at a time. Copying other’s meal plans is a fantastic idea too. Thanks Stacy! Pepperplate is a decent free alternative to Plan to Eat. Not as many features, but free. I recently had a meal planning meltdown. For some reason, it takes way more brain power than I have available these days. I’m pretty sure you are going to convince me to try Plan To Eat. You already got me with the USA Pans (which are amazing). Thank you so much for mentioning me in this post, and during the scope! I also appreciate that you like bread and butter…and that you like toast and jam. Late last year, I downloaded “The Confident Mom” weekly planner. I don’t mind the meal planning so much – it’s the housework planning I loathe. But this planner puts both together, and it’s been PHENOMENAL in our house! I delegate daily cleaning tasks to each family member, and I list the week’s dinners. My house stays relatively clean because we’re doing a little something each day, and my dinner ideas are already on my list, so it’s done. I usually go thru my freezer and pantry on Sundays to see what I have that I can work with or if I’ll need to hit the store that week. It’s really been a lifesaver that’s kept me from buying something when I’m out simply because I can’t remember if I already have some at home. Do I love meal planning? Not particularly. But having a plan definitely saves a lot of last minute “what am I going to make for dinner” freak outs! Yes! That’s a great planner! I love recommending it. 🙂 You are so right – doing something each day is key to keeping things up!